All the sizes listed achieve a higher Aerodynamic Free Area of more than 1.0 Aa m2 in a Lobby and 0.70 Aa m2 in a stairwell as per the requirement of EN 12101-2, not the grey area ""free vent area"" that is often quoted. 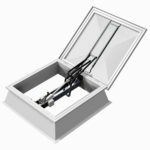 * Not suitable for Stairwell use without Wind Deflectors because does not achieve an Aerodynamic Free Area of more than 0.70 Aa m2 in a stairwell as per the requirement of EN 12101-2, not the grey area "free vent area" that is often quoted. 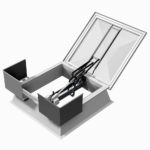 Abbreviations: Aa = Aerodynamic Free Area, Cv = Coefficient flow Mardome Trade Electronically Operated Smoke Vent Rooflights are individual polycarbonate domes intended for easy installation on flat roofs of all modern building types to provide natural smoke and heat exhaust, as well as comfort ventilation.